I think aliens have invaded my life. Eddie has started drinking green smoothies for breakfast. Eddie has started eating spinach salads for lunch. The salad part isn’t a big deal as he has always enjoyed them, but the spinach part? Huge. Eddie has started eating kale salads. Eddie has started asking me to make kale salads. I don’t even know who we are anymore. Eddie loves Caesar salads. Eddie has refused to ever ever ever eat kale, other than in chip form. Eddie ordered a kale Caesar salad, unbeknownst to him. I mean it said “kale” in the title… but you know. Eddie liked the kale Caesar salad. A whole bunch. And the rest is history. I thought things would start and end with the Caesar version. I mean, Caesar salads are so delicious and it’s in large part due to that creamy dressing, but also lots of cheese and croutons. Garlicky, buttery, toasted cubes of bread. One of the only reasons to eat salads, let’s be real. My love affair with kale started hot and heavy by covering the torn leaves in olive oil and baking until crispy. No, I never actually thought they tasted like potato chips or resembled kettle cooked salt and vinegar bits of heaven, but the whole method made me fall in love with kale, made me eager to try more vegetables after a lifetime of loathing and even convinced my husband that they could be a thing. 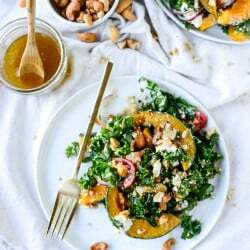 When I finally moved on to kale salads, I learned the hard way that for me (and us), the kale has GOT to be massaged and marinated. I still can’t do it any other way. Often I go with the easy olive oil and salt and pepper rub (even before using Caesar dressing), but for this salad I went with maple syrup. The thing is – I probably (obviously) like the kale because of the chew and texture. So what happens when you add MORE crunch? Like I could just eat this salad for weeks at a time and not even hate life. Crunchy, honey roasted cashews, sweet caramely squash, thinly sliced red onion (which is also marinated, so say bye bye to bitterness), tangy, creamy goat cheese. Pretty sure that quad is all we need for Monday. Oh oh! But how could I forget – the stovetop toasted garlic breadcrumbs? Easy. Crispy. So much flavor. I know I’ve been on the squash bandwagon and I gotta say that I don’t think I’m bailing anytime soon. But! You can absolutely leave the squash out of this if you want. I don’t want to tell you what to do or anything, but just maaaaybe you can swap it out for bacon? I knew we were the best of friends. Preheat the oven to 425 degrees F. Line a baking sheet with parchment paper. Place the squash on the sheet and drizzle with olive oil. Season with nutmeg, salt and pepper. Roast until tender and caramely, about 25 to 35 minutes. 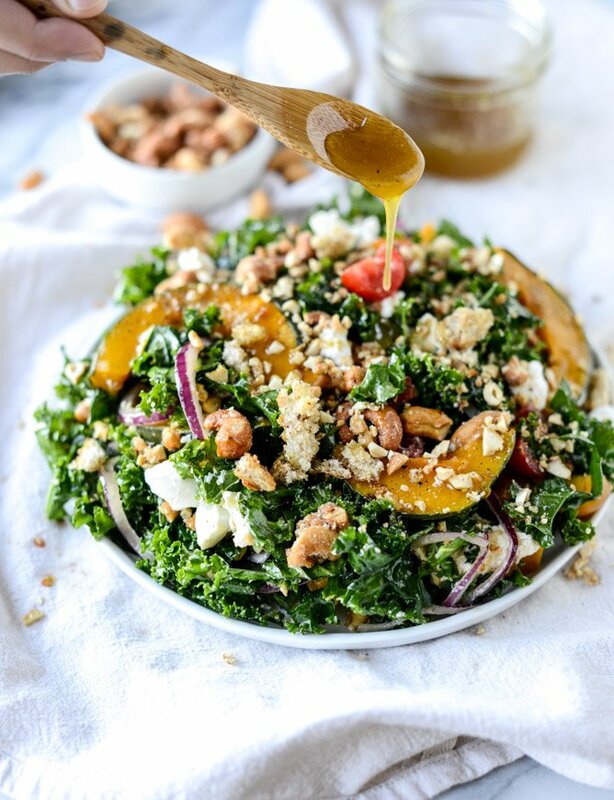 While the squash is roasting, place the kale and onion in a large bowl. Cover with half of the maple dressing and use your hands to massage the dressing into the kale. Evenly distribute it and massage for 3 to 4 minutes. Let it sit for 20 minutes or so, while you finish preparing the ingredients. Heat a large skillet over medium heat and add the olive oil. Toss in the breadcrumbs and the garlic powder, stirring to coat. Cook, stirring often, until the bread is toasty and crisp, about 5 to 6 minutes. In a large bowl, whisk together the mustard, garlic, vinegar, salt and pepper. Whisk in the maple syrup. Slowly stream in the olive oil while whisking the entire time, until the dressing comes together. This dressing is going to be sweet, so if you want it a bit more tart, I would taste and add some vinegar 1 to 2 teaspoons at a time until your desired taste is reached. You can store this in the fridge for a week or so – just shake well or stir before using. Can we drink this with pumpkin beer? The most basic of the basic. Pingback: Say Goodbye To The #SadDeskLunch In 2017 With 7 Easy, Make-Ahead Recipes | Your News On Time! Love this recipe…where do you source the lovely bronze cutlery?